Can you boil water? If the answer is yes then you have the skills required to make hairspray from home! Not only is it simple to make but it is also inexpensive and made with natural ingredients you probably already have in your home. By making your own hairspray you will be avoiding all the nasty chemicals found in store bought hairsprays. I honestly do not wear hairspray very often but when I do I want to use a product that is natural and non-toxic. What better way to know exactly what I’m putting on my hair then by making those products myself. I discovered how easy it is to make a homemade & natural hairspray and best of all it works great! Now I’m sharing how simple it is to make hairspray with you and of course a cute label to go on your bottle because I love to make cute labels for everything! A simple diy hairspray using natural ingredients. So easy to make and works great! Recommended essential oils: Geranium essential oil, Lavender essential oil, Peppermint essential oil, Rosemary essential oil and Clary Sage essential oil. Avoid citrus oils (Lemon, Lime...) as they can lighten your hair if exposed to UV light. Bring water to a boil and stir until sugar is dissolved. Remove saucepan from heat and cool. Add essential oil and high proof alcohol to sugar water. Pour cooled sugar water mixture into an 8 oz fine mist spray bottle. Customize this recipe for the perfect hold for you: Use more or less sugar depending on how strong you want the hold to be. 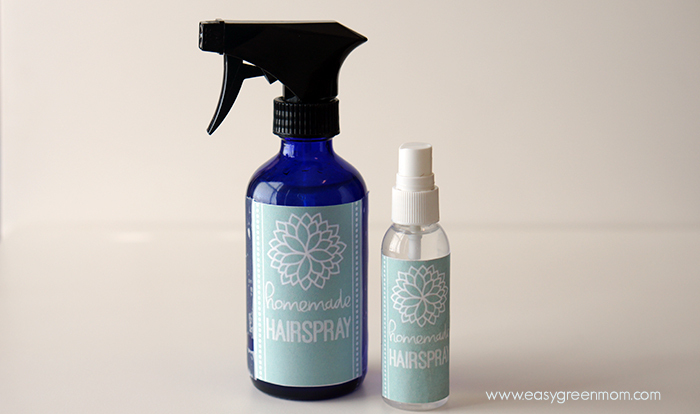 Free Printable for hairspray bottle. 2 labels per sheet one 8oz and 4oz. Print, cut and tape on to the bottle. You can use shipping/mailing tape or print on sticker project paper. Pretty simple, right? I hope this inspires you to kick store bought hairspray (and all their yucky chemicals) to the curb and give this simple and natural DIY recipe a try! Wow, it’s that easy?! I’ll have to try it!! I am going to try this. I usually use a little spray for flyaways. This is a great idea, I would love to try it rather than using all the crazy chemicals that you get in regular hairspray. Oooh Im totally wanting to try this!! I have to use so much and I hate all the chemicals!! Wow! i didn’t know you can make your own hairspray! thats crazy!! Can I use witch hazel instead of vodka? Rubbing alcohol or witch hazel would be good substitutes for vodka. I’ve got to try this–I had no idea you could make your own!